I have a new cookbook. Actually I’ve had it for a few months now, but with Christmas and everything, I forgot about it for awhile. Until the past few weeks, I never tried a single recipe. That didn’t prevent me from having a very good feeling about it. (Or from giving it as a Christmas present several times.) It’s called Plenty. Anyway. I’ve been playing around with it a lot. Usually, if I get five recipes from a single cookbook, I feel like I’ve done really well. With Plenty, I’m going to challenge myself to cook every recipe. The writing and the photographs are so inspiring! 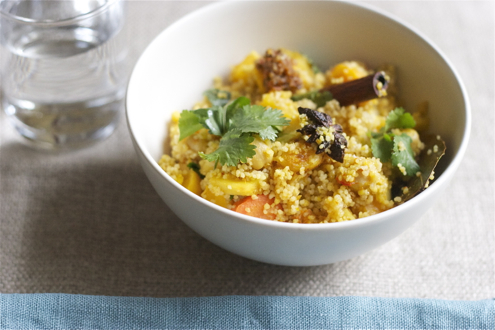 On Monday I tried the Winter Couscous and I’ll definitely be making that again – maybe even tomorrow. It’s sort of funny – how much I like this book because I have no instinct become a vegetarian, and this is a book all about vegetables. I simply couldn’t give up meat as I love to cook with it and I would miss the flavor too much if I stopped eating it altogether. However, after reading Plenty, I could actually see how I might make an entirely plant (ok, plant plus butter and cheese!) based diet work. As soon as I started flipping through this book without a speck of speck, a shred of pork, a breast of quail, a leg of duck, I wanted to try everything. I’m not even going to skip the eggplant section. And I nearly always think eggplant is creepy. Another thing. This Ottolenghi – he’s not so chef-y in his cooking. Complicated techniques are not what you’ll find in his book. This is food with a wild riff-y flamboyance, full of vim and a middle eastern accent, but no craziness. It sort of reminds me of this roommate of mine from college, Craig, who used to cook for us on weekends. Many late Friday nights found him in our shared kitchen, heaps of ingredients on the cutting board, a glass of wine by the stove, music playing. More and more people would show up and he’d just add a little of this or that to the sauté pan. When we finally sat down to eat, it was often unpredictable and always delicious. We loved those evenings, the fun of Craig’s happy confidence in the kitchen. There’s something about the loose and playful style of cooking in Plenty, fearlessly combining flavors of far reaching origins, that reminds me of Craig cooking. Ottolenghi’s recipes are those of a gleeful, passionate chef, devoted to color and flavor. In Plenty, I found my favorite ingredients in dazzling and unexpected combinations. I’m just wild for this book. I made the Winter Couscous on Monday night after we got back from skiing. You might think, judging from the longish list of ingredients, that this was an odd choice, after a rough drive down the mountain through a blizzard. The recipe did require a perhaps too extensive run to the grocery store when we were all wiped out. (Thanks Martin! It was worth it though…right?!) But the vivid colors! The aroma! The deliciousness! I totally think it was worth it. If I were you, I’d make it on a relaxed Sunday the first time. You’ll see how simple it is and make it again right away. In a large roasting pan, put the carrots, parsnips, shallots, cinnamon sticks, star anise, bay leaves, 4 tbsp olive oil, 3/4 tsp salt, ginger, turmeric, paprika, and chile flakes. Toss well. Add the squash and toss. Return to the oven for 35 minutes. Add the apricots, chickpeas and 1 1/2 cups of water. Cook for 10 more minutes. In a large Pyrex or other heatproof bowl, combine the couscous with 1 tbsp olive oil, the saffron, and 1/2 tsp salt. Pour the boiling stock over the couscous, stir, and cover the bowl with plastic wrap. Leave for 10 minutes. Add the 1 tbsp butter to the couscous and fluff until the butter is melted and incorporated. Cover with the plastic wrap again and leave near the stove to keep warm. To finish, mound the couscous on a large platter. Stir the harissa and preserved lemon into the vegetables. (Or, if you have sensitive children, serve the spicy harissa in a pretty bowl with a little spoon at the table, to be mixed in to taste.) Taste the vegetable mixture for salt and adjust if necessary. Spoon the vegetables and any juices onto the couscous. Strew cilantro leaves over the top and carry this gorgeous, fragrant mess right out to the table. 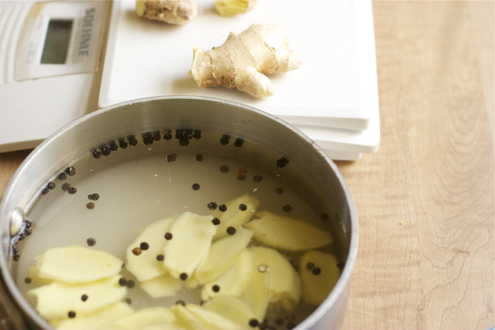 Leave the whole spices in – they are so beautiful on the platter. 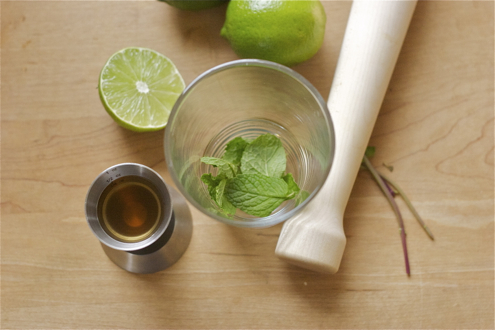 Put the mint leaves in a tall glass, pour in the syrup and muddle until you can really smell the mint. 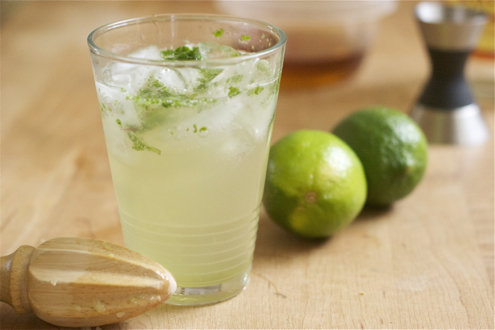 Fill up the glass with ice and pour in the gin and lime juice. Combine the ingredients in a small heavy saucepan and simmer for 30-40 minutes. Cool completely. Strain. Keeps for two weeks in the refrigerator. This entry was posted in easy, Uncategorized and tagged easy, seasonal, vegetarian. Bookmark the permalink. I LOVE this recipe. I taught it along with the Winter Slaw at my Plenty classes last week. I’ve made a million things like it over the years but this one is the best by far. Your photo is so pretty! Thank you! Photographing food in the winter is very challenging – at least for me. 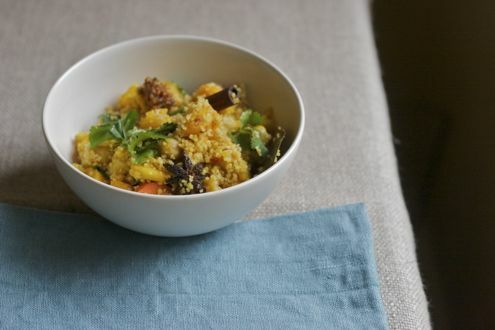 I love this recipe too (root vegetables +apricots!) and even though the ingredients list looks long, most of it entails scooping teaspoons of spice – there’s not so much to do. It’s a keeper. Maureen! So nice to hear from you! Is there any chance you’ll be in California this summer? Come to Torodel with the kids – we would have so much fun!